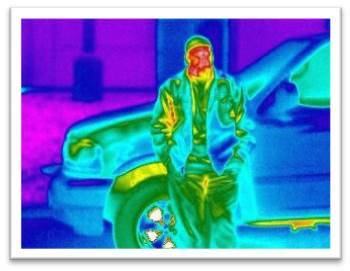 Infra-red radiation is a form of heat transfer. It has moderate energy, a low frequency and a wavelength of a few mm. It is used in heating (in convection ovens and heat lamps), in thermal imaging and for communications in optical fibres and TV remotes. It can be dangerous as it can cause burns. Black is a good absorber and emitter of IR and silver is a good reflector.